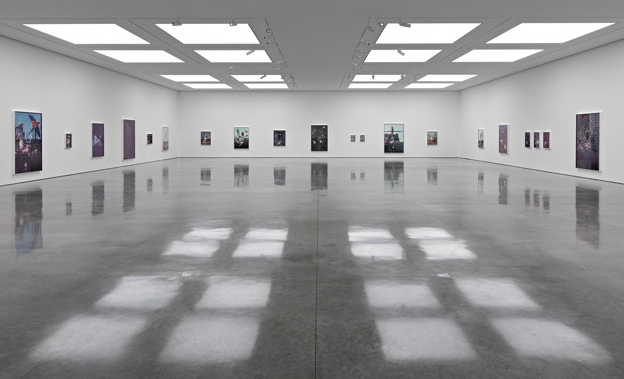 The paintings occupy the South Galleries, a vast space – the largest at the Bermondsey gallery – which is without dividing walls for the first time. I’m not entirely sure, but I think this may be to ensure that the work straight ahead of you as you walk into the gallery is a long way away so it’s hard to see quite how poor it is. The paintings vary in size quite a lot – the smallest are a little under half a metre high, the largest a couple of metres or thereabouts – but in style and subject matter, not much changes. Hirst’s habitual concerns are here – above all, life and death – and there are references aplenty to other works in the form of sharks’ jaws, butterflies, vitrines and dots. Fundamentally though this is a series of still lives painted with a complete lack of finesse. References to art history also abound. 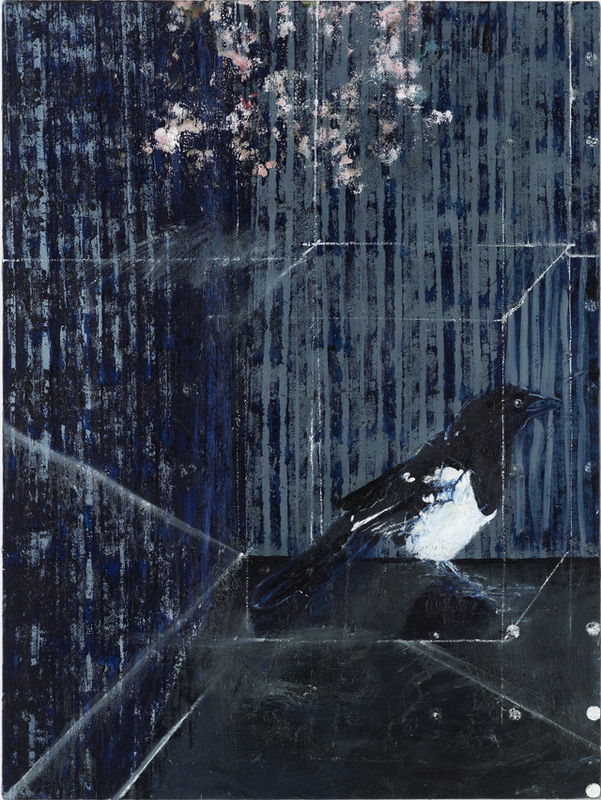 White lines contain elements like the magpie in the painting of the same name, seemingly a direct reference to Francis Bacon. Guitars and the abundance of blue suggest Picasso. 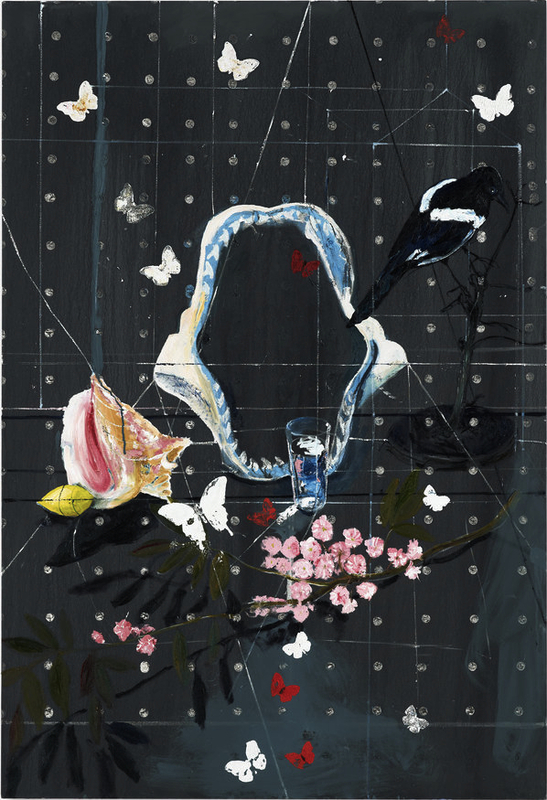 Who knows what other artists Hirst was thinking of: Cezanne, perhaps; Matisse, maybe. Whether these are intentional references is hard to say; it seems more than possible that the paintings are simply clumsily derivative. The spot paintings may be made to order by studio assistants but the work here – painted by the artist himself – feels, if anything, even more churned out. It’s hard to contemplate any other circumstances in which White Cube would hold an exhibition of paintings such as these. And it’s hard to understand why Hirst himself hasn’t managed to take a step back from the work and realise that it’s – and I’m being generous here – at best no improvement on the blue paintings. While I might have bemoaned the worst excesses, I found a fair bit to like in his Tate retrospective – if nothing else, it was good to see the early work again, tired though some of it looks now – though there was also plenty to question. Here there is only really one question: why did nobody tell him? Hirst once said “I can’t wait to get into a position to make really bad art and get away with it.” Sadly, he need wait no more. 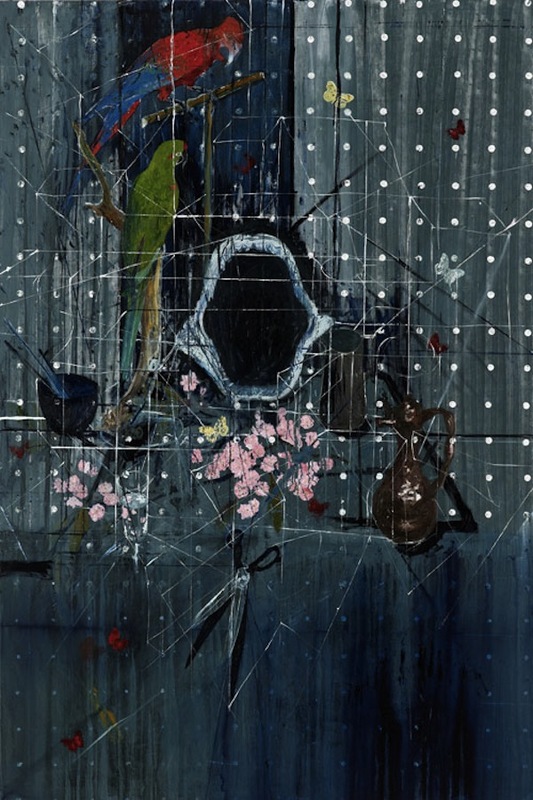 Damien Hirst: Two Weeks One Summer is at White Cube Bermondsey until 8 July 2012. It’s painting, but not as we know it. 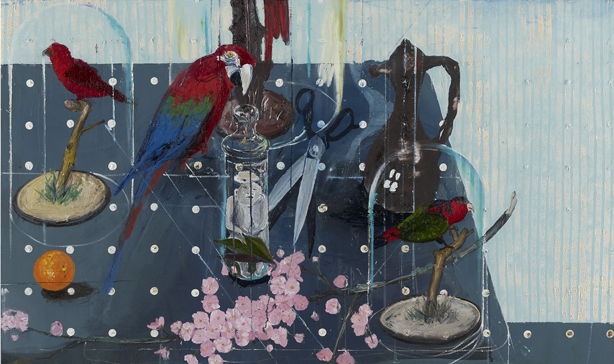 This entry was posted in Painting and tagged art, Damien Hirst, painting, The Magpie, The Sorrow (with Magpie), Two Parrots, Two Parrots with Grotesque Baby, Two Weeks One Summer by Ann Jones. Bookmark the permalink. Is it a sign of his success that so many bloggers choose to spend our time saying nasty things about Mr Hirst? Hmm. I suspect it has something to do with massive prices along with a sniff of the derivative.